Before I post up this great deal at ShopRite, I just want to take a minute and say something. Because I have to spend so much time in front of this computer, doing the match ups, researching deals, making sure the website stays up and running (which is a never ending challenge), and all the other crazy, behind the scenes things that goes along with the site, I don’t get a lot of time to scope out the stores as much as I would like too. And, that leads me to what I’d like to say, which is a big THANK YOU to you guys for the help you provide in that category. It’s emails and comments like this one from reader Ueen, that put a big smile on my face. I had heard rumors of this clearance item but I didn’t had time to get to ShopRite to check it out. And, there in my inbox was this email and picture. And, I smiled and thought, what a great bunch of readers I have. I feel very blessed. So, enough mushy stuff, I know you guys want to know the deal…. 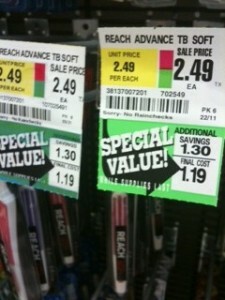 Well, for those of you that can no longer get the $0.99 Reach Toothbrushes, you are in luck. 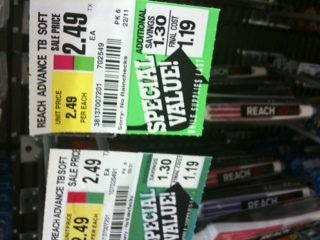 ShopRite has the Reach Advance Toothbrush marked down to $1.19. So, you can use these to score that awesome catalina deal that is still going on.